VENEZUELAN President Nicolas Maduro promised more revolution and less corruption as tests were carried out at polling stations across the country prior to elections due later this month. Mr Maduro confirmed that his government was “against corruption and for revolution,” promising a clampdown on “financial mafias” that are attempting to destabilise Venezuela, siphoning millions of bolivars out of the country. Neoliberal forces have been rounding on Mr Maduro’s socialist government. The European Union demanded last week that Venezuela abandon the elections. citing concerns over transparency and democracy. The International Monetary Foundation also issued a motion of censure against Venezuela last week for failing to provide it with data relating to economic performance, including import and export figures. The May 20 elections will be the 24th in the country since Hugo Chavez came to power in 1998, setting in motion the Bolivarian revolution. 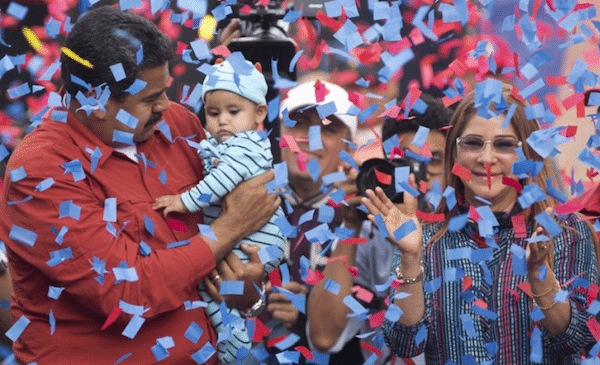 With Mr Maduro enjoying a comfortable lead in the opinion polls, the U.S. and Venezuelan opposition groups have vowed not to recognise the outcome. But Communication Minister Jorge Rodriguez said the country had one of the most audited and transparent systems anywhere in the world. “There is no system more transparent than Venezuela’s. Today’s simulation is a practice audit because it lets us evaluate the system’s logistics and how well the machines are functioning and today’s test matches the previous 16 audits that were also successful,” he said. A U.S.-backed coup against Mr Chavez in 2002 failed after supporters poured onto the streets demanding his release. However, the U.S. has been accused of continuing efforts to destabilise Venezuela and other left-wing governments in Latin America. He said CIA and State Department documents prove that the U.S. was involved in the coup against Mr Chavez. “They helped fund and train the people who did the coup and they made statements following the coup that they knew were false in order to help the coup consolidate itself and they failed in that case,” Mr Weisbrot alleged.